The easiest and most accurate way to judge the value of a jewelry or craft book, is to look through the designs, and wait for inspiration to strike. An excellent beading book will have you eager to sit down and start creating long before you've flipped to the last page. Creative Beaded Jewelry will easily capture the imagination and creativity of anyone who loves to play with beads. The designs are not only fun and deceptively simple, but use materials that you can find at most bead and craft stores. The jewelry is exciting and inventive, but budget and stash-friendly. After a brief introduction, the author and designer, Sigal Buzaglo, gets right down to business. The beginner section is equally brief, but does cover all of the basics, so that new beaders will have a good understanding of the techniques and materials they will be working with. The full color photographs and diagrams are easy to understand and follow. There are 31 gorgeous jewelry projects to try, including necklaces, bracelets, earrings and a very clever leather charm ring. Sigal gently guides readers through many essential jewelry making techniques by presenting interesting and easy to make designs that are hard to resist. My personal favorites are the Trendy Twisted Bracelet, which combines leather cord with seed beads and wire wrapping, and the Super Hoop Necklace, which features a ceramic donut on a multi-strand, macramé-like necklace. 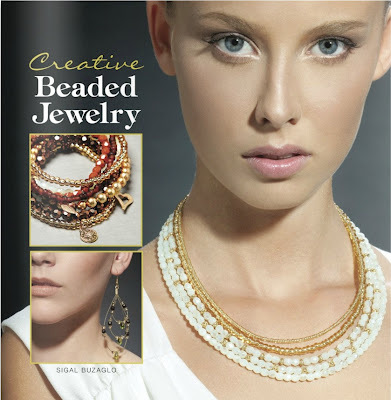 Each project in Creative Beaded Jewelry includes step-by-step instructions and photographs, plus handy tips for getting the most polished piece of jewelry on your first try. Beginners and expert beaders will both enjoy the clever and elegant combinations of beads, colors and textures. What is your all time favorite stringing material? One winner will be chosen at random on Monday, July 18th. If you do not have a Blogger profile with email contact enabled, be sure to leave a contact link (website, shop, Facebook, etc.) or email address (beadlover AT yourmail.com), so I can get in touch with you if you win. I have been working a lot with wire lately. In particular, I love using black annealed galvanized steel wire. I love the natural patina that it has. I love using Fireline, but would have to say my favorite is Nymo thread, its great for peyote and allows the work to be soft and supple, and has some give to it if you are a tight beader. Love your blog and look forward to reading your new posts. My favorite stringing material is nymo thread. So excited for a chance to win! Is it too selfish of me to want to win this one, too? I'm a beadaholic and this looks so cool for addiction feeding! Thanks! Looks like a great book! My go-to for beadweaving is Fireline 6 lb. test, but for beaded kumihimo work I depend on Superlon bead cord. For seed beads (weaving) my favorite is Fireline, for bead stringing it would be Beadalon 49. Thanks for another chance to win something! When I string, I usually use 49 strand beading wire, but I mostly beadweave, and love One G thread. My favorite string material is Fireline! Since I am not real into stringing I have no preference but it looks like a great book. My favourite stringing material has to be Beadalon 7 strand because it's inexpensive and great to learn with. However my beading buddy kitten prefers just about anything that dangles and she can catch! Looks like a book I would love to add to my collection!